The Global Economic Symposium (GES) is an international platform for sharing opinions and developing recommendations on the modern challenges and threats facing the world, such as energy security, demographic policy and the impacts of climate change. “Redefining success” was the overriding theme of this year’s forum, which brought together over 600 leading experts, political and public leaders to discuss issues concerning stability on financial markets, the economic situation in the Eurozone, situation in the Arab world, cybersecurity and more. INSOR’s Director for International Development Sergey Kulik took part in the regional Council of Council’s meeting in Rome September 8-10. The Council of Council’s is an informal platform for exchanging opinions among the top analytical centers of the world’s leading countries, mainly G20 members (with one organization representing each country). Russia is represented in the Council of Councils by the Institute of Contemporary Development. Chairman of the Management Board of the Institute of Contemporary Development Igor Yurgens took part in a meeting of the Presidential Council for Civil Society and Human Rights. Excerpts from meeting are available in English on the website of the Kremlin press service. Igor Yurgens, Chairman of the INSOR Management Board, took part in the Shangri-La Dialogue, which is dedicate to security issues concerning the Asia-Pacific Region. Organized by the International Institute for Strategic Studies (IISS), this is the 12th time that the conference has been held. From May 31 to June 2, 2013, experts, government leaders, heads of defense and security establishments in Asia-Pacific states and their partners in Europe and America gathered in Singapore to discuss common approaches and specific issues of regional security. Russia was also represented at the forum by Chairman of the Federation Council Committee on International Affairs Mikhail Margelov and Deputy Minister of Defense Anatoly Antonov. 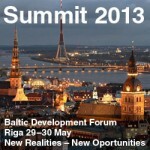 Chairman of the Management Board of the Institute of Contemporary Development Igor Yurgens took part in the 15th Baltic Development Forum in Riga on May 29-30. Speaking during the plenary session Role Models and Realities in the Baltic Sea Region, Igor Yurgens summed up the results of the Russia’s outgoing presidency of the Council of the Baltic Sea States (ending June 30, 2013). The Institute of Contemporary Development, German-Russian Forum, and Russian Presidential Academy of National Economy and Public Administration organized a conference on “The Middle Class: Historical and Sociological Issues” within the framework of Russian-German partnership in modernization under the foreign ministries of the two countries. A conference at the High Technology of ХХI–2013 Forum was devoted to the prospects for the development of oil and gas chemical clusters in the Russian Federation and the experience of member-countries of the Shanghai Cooperation Organization. The conference was organized by the Institute of Contemporary Development and Institute of Energy and Finance with financial support from the Business Council of the Shanghai Cooperation Organization. INSOR’s Management Board Chairman Igor Yurgens and Director for International Development Sergey Kulik have been included on the updated Academic Council of the Security Council of the Russian Federation. The new composition of the council was confirmed by a presidential decree on April 22. On March 18, at the Japanese Center in Moscow a presentation was made on the investment opportunities of the Primorsky Territory. The event was organized by the Institute of Contemporary Development and Primorye Investment Promotion Agency with support from the Japanese Embassy in Russia. Governor of the Primorsky Territory Vladimir Miklushevsky delivered the presentation before members of the Japanese Business Club, which unites approximately 200 companies and 40 private individuals. On February 26, a seminar was organized in Washington DC by the Center for The National Interest (formerly the Nixon Center) dedicated to US-Russia relations. Participants from the American side included Zbigniew Brzezinski, Dmitri Simes, Susan Eisenhower, Garry Hart, Areil Cohen, Richard Burt, Paula Dobriansky and other authoritative political figures and experts on Russia. Participants from Russia included State Duma Deputy Vladimir Pligin, Editor-in-Chief of Nezavisimaya Gazeta Konstantin Remchukov, Director of the Institute for Democracy and Cooperation Andranik Migranyan and Head of the Institute for Contemporary Development Igor Yurgens.